Before making it to the show this year I decided to take up Paul Pohwat's offer to come to the Smithsonian and enjoy a view of the collection in the backroom with Paul. I was shown where the reference book was and how to use it then we were off to the races. Six hours later I was more or less exhausted from opening scores of drawers to look at the minerals held within them. I think Paul could have kept on going though! A brief word about Paul is that he is the mineral collection manager for the Smithsonian. He knows the collection like his own family and his sense of humor is unparalleled as depicted in these two cartoons posted by his desk. Some may find it a bit coarse but I love this kind of humor. Imagine opening a drawer with over a dozen specimens of liroconite! Just two of the numerous banks of drawers containing the nation's mineral collection. One of two drawers with benitoite specimens. touch it it immediately transfers heat from your skin to itself and you feel like you are holding an ice cube - hence the slang term for diamonds as ice. Two minerals that found their way on to US postage stamps. An eye bulging specimen of rhodo with a 10+ cm crystal!!! A small portion of the gold on display in the Museum. Another small portion of the gold on display in the Museum. I said good bye to Paul and took off for Pennsylvania to see John White but took one last shot of an iconic Washington D.C. landmark. As mentioned above, I headed for rural southern Pennsylvania to see my good cigar buddy, John White. John was a former curator for the Smithsonian and he was also the first editor for the Mineralogical Record. I had an enjoyable night there with John and his wife Meryl. They served up crab cakes with blue crab from Maryland. The next day I was able to see what John had for sale in the way of minerals and picked out a small selection. Enough of that, I made it to Springfield for set up day on Thursday and settled into my mineral mindset. Hard to imagine that this place gets filled up in less than 24 hours. Late in the afternoon on set up day Phil Scalisi started to set specimens out. Not as large a crowd as in years past but I found some very interesting specimens with him. A 2.8 x 1.5 cm specimen from Phil of ludlamite from the Bull Moose mine, Custer Co. South Dakota! A group of five leaf gold specimens from the Bronzewing Mine, Goldfields-Esperance Region, Western Australia also from Phil. Initially, there did not seem to be too much new in the way of minerals at the show so I had to did a little deeper. Sometimes all it takes is a little effort and voila! New things are/were there to be found. First, Pink Tanzanite! Yes Pink Tanzanite! Steve Ulatowski, of New Era Gems, pulled me aside to show me the finest crystal left from a small 1.2 kg pocket that contained these things. They are all untreated too so the colors you see could probably be enhanced with some heat treatment but why? Just about the entire contents of the pocket were faceted into gem stones with only a few specimens left that were either too small to cut or had some other issues. The specimen pictured below is a vision of perfection with lustrous crystal faces and it is also untreated. There is a yellow color zone in addition to the pink. This 3 cm crystal was available for sale for $15,000 from New Era Gems. The same crystal above shows the dichroism and the yellowish hue. This is a 1.6 cm crystal I bought from Steve and that will be available in the update. This is what happened to most of the crystals from this rare pocket. I think this was over 12 carats and Steve had it listed at $115,000. Dudley Blauwet never fails to find something different! This year he had a small group of five or six specimens of deep maroon colored siderite with reticulated rutile from Hashupi, Shigar Valley, Gilgit, Baltistan, Pakistan. The crystals have good luster on one side only but the rutile is bright red. This is a 14.5 x 7.3 cm specimen of the new siderite with rutile. A close up of the reticulated rutile. An 8.5 x 4.5 cm specimen of scoria with abundant, lustrous crystals of tenorite up to just under 1 cm. Leonard Himes had a specimen that caught my eye in his booth. It was a specimen of rhodochrosite with pyrite, albite, columbite, bertrandite, apatite, and other pegmatitic minerals from Mount Mica, Paris, Maine. This assemblage is very similar to that seen from Kara Oba in Kazahkstan. He then pointed me over to the Rocks to Gems booth where they had more of these specimens available. I found one that was reasonably priced and also picked up Leonard's piece. All of the rhodochrosite has evidence of etching in situ and all have rhombic form. Two pictures of the same 11.5 x 6 cm specimen from different angles. Perhaps the most significant new find here was specimens of baryte from the Linwood mine, Buffalo, Scott County, Iowa! Ryan Smith had the largest number available at the show though Pete Gianfranco of the Enchanted Rock Garden also had some. Dan & Diana Weinrich took me aside and showed me some of the best of this new find in their van. They were not displaying them in Springfield as they intend to do so at Denver. The pieces Dan had were by far the best The crystals are typically grayish to amber in color due to varying amounts of included micro crystals of marcasite but most have very glassy luster. A few were recovered with free standing crystals on calcite matrix though most seem to have formed in narrow seams and fractures. Two images of one of the specimens I obtained for the update - a 9.5 x 6.0 cm crystal. A 14 cm specimen that will be available in Denver from Dan & Diana Weinrich. A 30+ cm specimen that will be available in Denver from Dan & Diana Weinrich. A 35 cm single crystal that broke in half on the drive from St. Louis to Springfield... another of the Weinrich's. 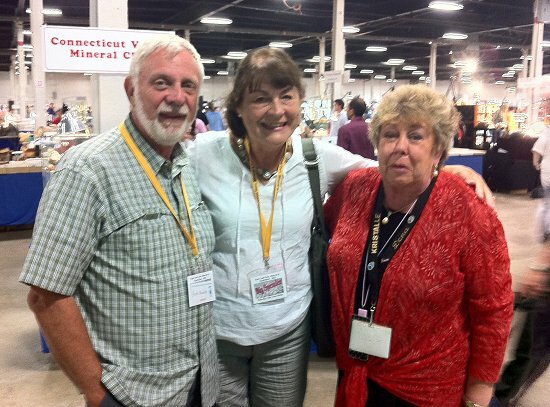 Elsewhere at the show I spoke with Robert Rosenblatt of Rocko Minerals. He told me that he and Kevin Downey of Well Arranged Molecules had obtained the John Marshall New England collection. I was stunned to see what was in that collection and picked up four specimens of wulfenite and pyromorphite from Loudville, a danburite from Lawrence County, New York and several other specimens. A 7 cm specimen of canary yellow wulfenite crystals of quartz from Loudville. A 12 cm specimen of pyromorphite on quartz from Loudville. A 6 cm specimen of danburite from New York - ex Larry Conklin piece. A 7.5 cm specimen of pale violet diaspore with clinochlore from the Chester Emery mine, Hampden Co., Massachusetts. Near the end of my time here I saw Herb & Moni Obodda and Donna Leicht. Knowing these people has enriched my life. This year the special display was that of artwork done by Fred Wilda with accompanying specimens from various private collections. Regrettably, my camera battery was on zero when I was ready to photo some of the displays. I find it enticing to see what an artist can do with a mineral specimen in terms of interpretation. Fred's colors are vivid and his imagination to extract the full essence of his subjects is quite compelling. My apologies Fred to not be able to share your artwork with folks!! I want to thank Marty Zinn and his tireless group of people that help to pull this show together. Dave Bunk, Bill Shelton, Bob Delano, Gretchen, Rose Zinn, Regina Aumente and most of all Laura Delano. Without this group of people a lot of people like me would have to do something else for a living. After leaving Springfield I drove to Warwick Rhode Island to visit with Herb and Monica Obodda in their new digs. They moved there this year and are completely in love with their new haunts. I can see why - fishing off the dock in the back yard, a pool to cool off in, great neighbors and a chorus of birds to learn about. I can't thank them enough for the lobster dinner, dip in the pool to cool off, conversations about many things and the Perseid Meteor shower to watch. I will be back! I fully intend to be back in Massachusetts again next year. Cheers! All images, text and stuff on these pages copyright John Veevaert -Trinity Mineral Company 2012 The material on these pages may not be used without permission.